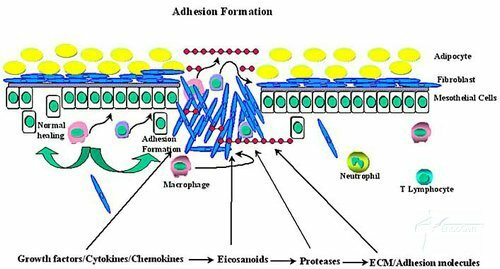 You are here: Home » Causes » How do adhesions occur? Rarely adhesions are present from birth. Adhesions commonly form in the abdominal-pelvic cavity as a result of inflammation, injury or following surgery – as part of the body's completely natural and normal healing process. Usually they occur as part of the healing that takes place after surgery, particularly abdominal surgery. Adhesions can also form after inflammation in the abdomen or pelvis. Adhesions develop as the body attempts to repair itself. This normal response can occur after surgery, infection, trauma, or radiation. Repair cells within the body cannot tell the difference between one organ and another. If an organ undergoes repair and comes into contact with another part of itself, or another organ, scar tissue may form to connect the 2 surfaces. During the body's reaction that leads to an adhesion, chemicals called inflammatory mediators and histamines are released from the blood (more specifically the blood's mast cells and leukocytes). Capillaries dilate. This allows leukocytes, red blood cells and platelets to concentrate at the injury site in a bundle called a fibrinous exudate. A variety of other factors are at play in the system such as as prostaglandins, bradykinin, chemotactic agents, lymphokines, seretonin and transforming growth factor. At this point in time fibrinolysis may clear the fibrinousexudate. In order for this to occur, plasminogen must be converted to plasmin by tissue plasminogen activator (t-PA). There is constant interplay between the t-PA and plasminogen-activator inhibitors. Unfortunately surgical trauma normally decreases t-PA activity while simultaneously increasing plasminogen activator inhibitors. If this occurs, the fibrinous exudate is transformed into an organized adhesion where fibers of collagen are deposited. Blood vessels begin to form, which leads to an adhesion.